Fused Glass Table offers unlimited custom options. Suited for residential and commercial applications, Marina Fused Glass Table integrates art glass that fuses together pieces of Amber, Beige, Smoke, and Iridescent Clear. Tabletop is 20 in. wide x 20 in. long, and table base is hand finished in Cafe Noir. With unlimited custom options, tabletops can be manufactured in nearly any size, color, or finish to meet exact specifications. Yorkville, New York--- Showcasing a unique and stunning fused glass tabletop, Meyda Custom Lighting has unveiled the Marina Fused Glass Table. Meyda Custom Lighting is a Meyda Tiffany company and a leading manufacturer and designer of custom lighting and décor. The Marina Fused Glass Tabletop (108003) integrates art glass that fuses together pieces of Amber, Beige, Smoke and Iridescent Clear. The tabletop is 20 inches wide and 20 inches long. 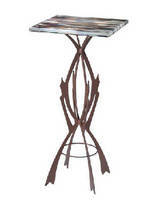 The intricate table base is hand finished in Café Noir. With unlimited custom options, Meyda Fused Glass Tabletops can be manufactured in nearly any size, color or finish to meet your exact specifications, for residential and commercial applications. Made in the USA, The Marina Fused Glass Tabletop is handcrafted by highly skilled Meyda artisans in the Yorkville, New York manufacturing facility. Meyda Custom Lighting is a Meyda Tiffany Company, the nation's leading manufacturer and designer of Tiffany lamps and decorative lighting. Although founded in 1974, the firm's roots actually date back to the early 1900s, supplying the Master Louis Comfort Tiffany and his Tiffany Studios with lighting products, and creating the original Coca-Cola stained glass lamps and chandeliers. With years of designing and manufacturing expertise, Meyda Custom Lighting has developed innovations, technologies and value engineering that transcend architectural lighting for any budget or economy, in today's commercial and residential markets. The company's diverse group of designers and engineers create custom fixtures, lamps, windows or accessories to meet the exact specifications of any project. A variety of lighting diffusers include stained glass Tiffanys, mica, fabric, fused glass, sand-carved glass, glass-blowing and acrylic. Fabricators work with steel, iron, aluminum, bronze, brass and copper, while employing a variety of craftsmanship techniques including forging, welding, forming, plasma cutting and soldering. The company's extensive palette of finishes features many textures and colors achieved by employing gilding, hand painting, power coating and electroplating. Convention and energy efficient lamping solutions are available, including LEDs, compact fluorescents, incandescents and more. For more information, contact Meyda Custom Lighting Toll-Free at (800) 222-4009. Website: www.Meyda.com Email: sales@Meyda.com. Meyda Custom Lighting is headquartered at One Meyda Fine Place, 55 Oriskany Boulevard, Yorkville, NY 13495.